I'm only going to be able to touch on the basics of this topic. Trust me, there's a lot more to it (which is why you need to scoot out and buy Dwight V. Swain's Techniques of the Selling Writer forthwith). But I'm happy to answer questions at the end if anything is unclear. Writer's talk about "scene" a lot. The pivotal scene. The opening scene. The climactic scene... but did you know that there are multiple kinds of scenes (on a technical level), and that they build on each other like bricks on a house? "A division of a story, or of an act of a story, usually representing what passes between certain characters in one place." 1. There is a stated goal. 2. A conflict or obstacle occurs. 3. Events take an unexpected turn, thwarting the original goal. These three elements are the building blocks of your technical "scenes". 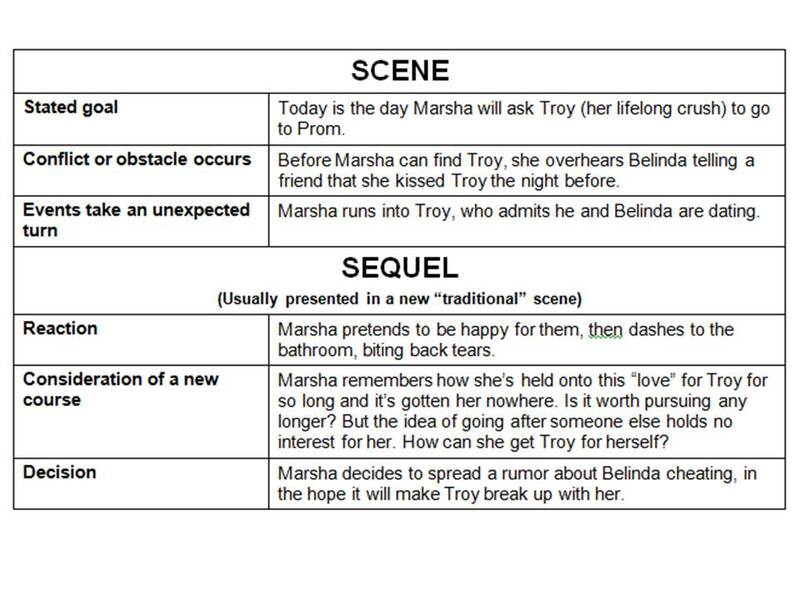 Unless a scene includes these elements, it isn't a technical scene, it is sequel or transition. In the most basic sense, a novel is made up of ever-increasingly complicated, intertwining scene and sequels. Scene is defined above. Every book should open with a scene which includes those elements. 1. Reaction to the events in the scene. 2. Consideration of a new course (mulling your options). 3. Decision / Determination of a new goal. Do you see how this might become a cycle? 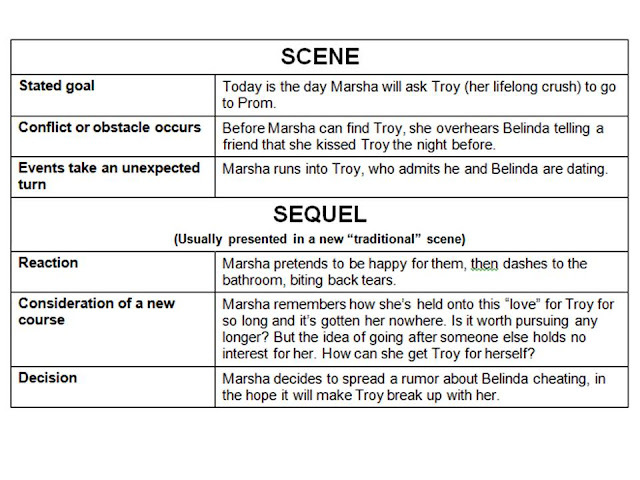 Hopefully that demonstrates how scene and sequel work. I'm keeping it very simple, just so we can become familiar with the foundational structure. Obviously, the more skilled you become in using the structure, the more intrinsically you can combine them - giving one character a reaction, consideration and decision during the midst of a parallel goal, conflict, unexpected event. Or take one character through their conflict and event, while another reacts to the previous scene... and so on. The important thing to note is: If your novel seems to be getting off track, or you're losing readers one hundred pages in, it may be because you've haven't been employing this structure. Without them knowing it, this is the structure that draws a reader inexorably forward into your story. 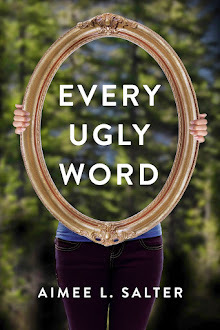 With the constant understanding of what the main characters are aiming for, the reader is able to gauge whether or not the story is going well. Because you keep introducing conflict, thwarting the goals, and changing them, tension builds. The reader starts to wonder, will the couple get together? Will the murderer catch his prey? Will the dictator kille everyone we're coming to care about? If you're receiving feedback that your pace is dragging, the reader isn't connecting with the characters, or the story feels aimless, try reading through your manuscript with this formula in mind. Identify the moments when your characters haven't stated their goals. Make sure every time something happens, the reader gets a chance to hear (or more importantly, see) how the character feels about it. Make sure your conflicts are organic, and throwing the main characters out of their chosen course. Then start the whole process again. Your Turn: Any questions? Do you understand why this structure will keep your story on point? Are you uncertain how to apply any of the elements? Yeesh. Don't you just love spammers? But great post Aimee! And the graphic helps! Grrrrrr.... Yes! I'm getting tons of them at the moment, too. I'd like to read more about your writing tips since it has added a great deal to my knowledge. Kindly keep posting such information in order that people like me can easily enhance our knowledge as you.And write my essay properly.